Manage efficiently the debt and financing of your company with our dedicated solution. 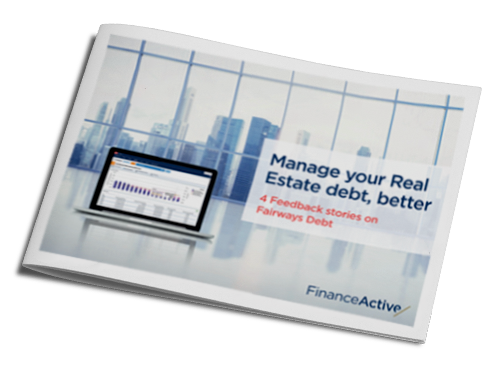 TH Real Estate, BNP REIM, CBRE … Several real estate companies have made the right decision by choosing Finance Active as a partner for managing their debt. Download our e-book and discover, through business cases, all the issues and advantages of our online solution. Several subsidiaries and reporting standards, multiple loan profiles, specific deadlines to monitor … having a centralised and precise vision of the debt is a crucial issue for any company, especially in the real estate sector where financing strategies can be complex. The Fairways Debt SaaS solution tracks all information via an ergonomic interface. Share data in real time and communicate with your employees. Deployed in just a few weeks, the solution allows you to identify risks and opportunities without delay, guaranteeing you an optimal control of your debt. Knowledge, agility and intelligence … thanks to Fairways Debt, say goodbye to Excel files and master the management of your debt, perfectly.